Since moving to North Carolina a few months ago, my family and I have enjoyed getting to know our state and the people who make this such a great place to live. Given my role as president and CEO of Blue Cross and Blue Shield of North Carolina, I’ve made it a point to ask people what they think of their health care. I am well aware that health care costs are out of control and, as a result, the premiums you pay for your health insurance are also too expensive. In my many conversations, there is one constant: People don’t feel like they are getting what they pay for when it comes to health care. We are working to introduce new approaches that will improve quality and address rising costs. We’ve made some progress, but it is time to do even more. 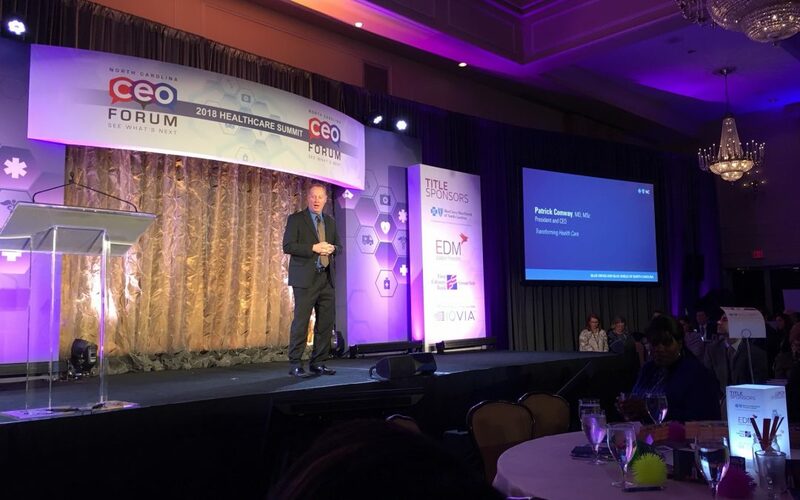 In a recent speech to North Carolina CEOs at the NC CEO Forum, I shared some personal observations on health care and the challenges we face. Our biggest challenge is that we are not getting what we pay for in health care. We are working hard to make the cost information we provide even better and easier to access. I am a practicing physician who volunteers on weekends to take care of hospitalized children and their families. Being a practicing physician gives me a deeper insight into the challenges that patients and families face in our health care system. I want Blue Cross NC to be a health plan that cares deeply about patients and families. We need to make sure people are getting their money’s worth by paying for quality outcomes, not quantity. Providers should be paid to keep people well, not for the number of tests or procedures they order. Consumer surveys consistently put health insurance near the bottom when it comes to customer service and ease of use. This is one of the areas we’re tackling in a big way at Blue Cross NC. I’ve made it clear that our goal is to deliver an exceptional consumer experience. The best way I know to do that is to treat each customer interaction like we’re helping a family member. As an industry, we need to harness technology and data to improve care. Care needs to be seamless and coordinated from birth to old age. And we need to make health care less complex and more transparent. North Carolinians need the right care, delivered at the right time, by the right provider. And it needs to be coordinated across an entire care team for the benefit of the patient. Blue Cross NC is leading the move toward coordinated care. In Wake County, we formed a collaborative partnership with WakeMed Key Community Care to improve quality and control costs. In just three years, we’ve saved our customers nearly $20 million by reducing unnecessary medical testing and procedures. Models like this need to be the norm, not the exception. Housing, hunger, and transportation are important social determinants of health. Our community partnerships look to address these urgent needs across North Carolina. In addition to these socio-economic factors, we need to make better lifestyle choices. Adopting healthy eating and lifestyle habits are great starts to impact the health and well-being of families across North Carolina, but there is more to this conversation. Investments in our communities can help control the cost of health care and improve the health of our state. We are proud to lend support to organizations like A Place at the Table in Raleigh. To help fight hunger and food insecurity, we will provide 20 meals a day for a year in their “pay-what-you-can” café. Our partners work tirelessly to impact lives, and we are proud to stand with them to strengthen programs and services that empower and educate our neighbors and customers. Empowering consumers with the information they need to navigate the health care system and make smart, cost-efficient health care decisions is key. We need transparency in health care. It’s just about the only thing we buy without seeing a price tag first. Without this information, it’s impossible for patients to make a fully informed decision. Consumers need to know what they’re paying and what they’re getting for their money. At Blue Cross NC we provide average cost information for more than 1,200 medical procedures at health care facilities across the state. These are complex problems to solve. But I’m optimistic that we can do it together. Together, we can achieve better health outcomes, lower costs, and best-in-class experience for all the people we serve.